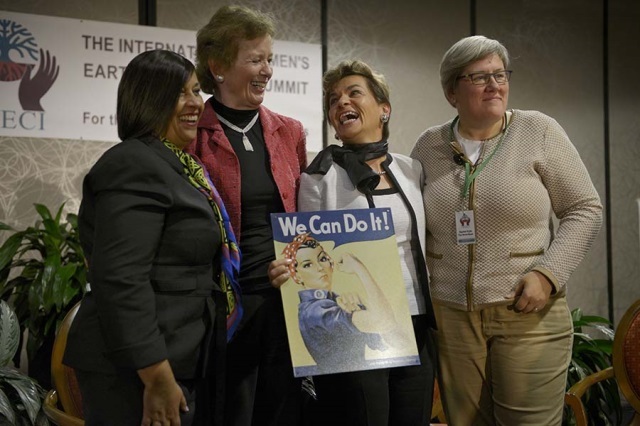 Mary Robinson discussed climate change as a matter of rights, justice and morality when she took part in a panel discussion as part of the International Women’s Earth and Climate Summit, New York. In the session on Sunday 22 September entitled: ‘From Ideas to Implementation: Perspectives from Women World Leaders’, Mrs Robinson spoke about the need for a climate justice narrative to mobilize political leaders to act with urgency and ambition in future climate agreements. Joining Mrs Robinson in the panel were Ms Christiana Figueres, Executive Secretary of the United Nations Framework Convention on Climate Change (UNFCCC); and Ms Rachel Kyte, Vice President for Sustainable Development at the World Bank. The discussion was moderated by Lorena Aguilar, Senior Advisor in the gender programme of the International Union for Conservation of Nature (IUCN). Mrs Robinson also spoke of the important of women’s groups and networks in informing and mobilizing demand for climate action. She addressed the injustice of climate change – that its impacts are hardest felt among those who have done least to cause the crisis – and called on the urgency felt locally by communities particularly in developing countries to be felt internationally so that it triggers action. Mrs Robinson also signed the IWECI-drafted declaration: ‘Women of the World Call for Urgent Action on Climate Change and Sustainability Solutions’. Addressing the panel, Ms Figueres said: “Women are the heart of the climate challenge, both with respect to impacts as well as in regard to potential solutions. Women need to participate more actively in the policy making process.